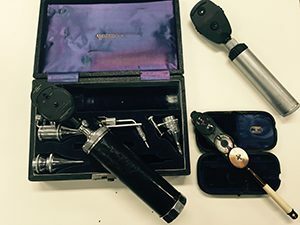 Clockwise from left: May’s ophthalmoscope (1935), Heine’s ophthalmoscope (1995), and Morton’s ophthalmoscope (1910). Hermann von Helmholtz (1821-1924), a German scientist, published the description of the first clinical ophthalmoscope in 1851. He called his invention the Augenspiegel or eye-mirror. Within a few years of his report, the ophthalmoscope became universally popular with eye specialists, many of whom attempted to make modifications and adaptations to improve the optics, illumination, and retinal image. In Britain, one of the leading ophthalmologists of the day, Thomas Wharton Jones (1808-1891) briefly mentioned the Helmholtz ophthalmoscope in the second edition of his text, The Principles and Practice of Ophthalmic Medicine and Surgery, published in 1855. However, some 10 years later, in the third edition (1865), not only did he devote a chapter to the subject, with comprehensive illustrations to instruct on the use of the ophthalmoscope, but he hinted at the possibility of a British forerunner of the invention. 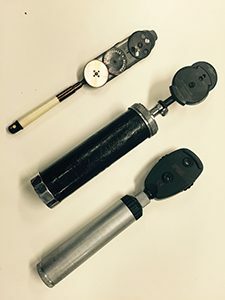 From top: Morton’s ophthalmoscope (1910), May’s ophthalmoscope (1935), and Heine’s ophthalmoscope (1995). However, he failed to see any benefit, told Babbage that it was worthless, and, as a consequence, Babbage abandoned his prototype! British ophthalmic surgeons embraced this new technology. A report from the Royal Ophthalmic Hospital published in The Lancet in 1855 described the contemporary position. If the British ophthalmologists were quick to employ the ophthalmoscope, how then was this device introduced to British (and Commonwealth) neurologists? Jackson joined the staff of the Royal London Ophthalmic Hospital (Moorfields) as early as 1859 and to the National Hospital for the Paralyzed and Epileptic, Queen Square in 1862. Jackson later reported that he learned to use the ophthalmoscope at Moorfields in 1863 and from that time urged his readers to be aware of the benefits of the instrument. He frequently claimed that it was impossible to investigate neurological disorders without using the ophthalmoscope. He drew attention to cases of optic neuritis (as papilledema was then known) when florid signs could be seen even in the presence of preserved visual acuity. He was adamant that the ophthalmic examination should never be omitted with “severe and continued headache.” Although Jackson is well known for many different facets of neurological practice, between 1877 and 1889, he devoted many of his invited lectures to medical ophthalmoscopy. Gowers (later Sir William) was appointed to the National Hospital for the Paralyzed and Epileptic, Queen Square in 1870, and a contemporary of Jackson. He too published numerous individual case reports in which the use of the ophthalmoscope was paramount. Although best known for his Manuals, published in 1886 and 1888, Gowers’ text on medical ophthalmoscopy, A Manual and Atlas of Medical Ophthalmoscopy published in 1879, was perhaps equally influential in its time. Gowers, with his superb clinical acumen and extraordinary artistic ability, delivered a valuable resource for neurologists and other physicians, and in doing so promoted the incorporation of the ophthalmoscope into a routine neurological examination. Andrew Stanford Morton (1848-1927), an ophthalmologist at University College, London, and Moorfields Eye Hospital, published a small pamphlet in 1884 in which he introduced his new “improved student’s ophthalmoscope.” Although his device still relied on an external source of illumination, this small compact model now incorporated a series of 29 separate lenses propelled by a driving wheel. This mechanism provided a much improved acuity and ease of use. The Morton ophthalmoscope became one of the most popular models for the next 40 years. Charles May (1861-1943), an ophthalmologist working in New York, is best known for the Manual of Diseases of the Eye, published in 1900. The book became a classic text and atlas of ophthalmology, going through 23 editions between 1900 and 1963. The May ophthalmoscope, with an internal illumination source, similarly went through many editions and proved to be popular in routine practice. Catherine E. Storey, MBBS, FRACP, MSc, is a clinical associate professor at the University of Sydney School of Medicine, Australia. Peter J. Koehler, MD, PhD, FAAN, is the editor of this history column. He is neurologist at Zuyderland Medical Centre, Heerlen, the Netherlands. Visit his website at http://www.neurohistory.nl/. Training More Neurologists: Is the Investment Enough? 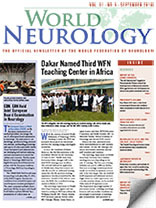 Neurology in 2050: Are You the Next Jules Verne?